From executive producers Terrence Malick, Natalie Portman and Chris Eyre comes a fascinating new documentary by Jack Pettibone Riccobono, The Seventh Fire. Rob’s 37-year story spans 39 foster homes, five trips to prison, and a near lifelong affiliation with the Native Gangster Disciples, a criminal gang that he has helped bring to Pine Point—also known as “P-Town”—a small Native village in northern Minnesota on the White Earth Indian Reservation. Rob is more than a gangster with a long rap sheet; he is also a loving father to his daughter Persephone, and a wickedly smart and sensitive writer who aspires to literary greatness. 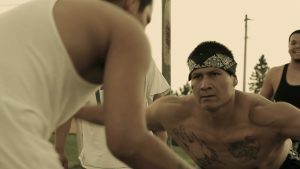 Late in the film, the solitude and sobriety of prison life lead to Rob’s cultural awakening: he becomes the leader of the prison’s Native Culture Group and begins writing a novel about his childhood, bringing a lyrical perspective to his painful and complicated story. On the cusp of his eighteenth birthday, Kevin finds himself at a different sort of crossroads; he has the opportunity to reconnect with traditional Ojibwe ways, but continues to be pulled towards the criminal lifestyle of his mentor. Early one morning, Kevin’s father describes to his son the significance of their clan: “Wolf clan means that’s the animal we represent. Power. Intelligence. Endurance. A wolf can be passionate and it can be very destructive.” At one point in the film we see Rob riding a motorcycle on the open road, a warrior choker necklace strapped proudly around his throat, knocking against the gang tattoo on his chest. At another moment we find Kevin trying to honor both his tribe and his gang affiliation by getting a wolf clan tattoo of his own. Together the lives of Rob and Kevin present a devastating counter-myth to textbook notions of the American dream, and they force us to confront the modern-day ramifications of what are still the most overlooked aspects of American history. Jack Pettibone Riccobono (Director, Producer, Writer, DP) has produced and directed a wide range of work across the five boroughs of his native New York City and around the world, from Moscow to Shanghai to Freetown. His narrative short KILLER premiered at New Directors / New Films and won Best Short at the Nantucket Film Festival. His short documentary THE SACRED FOOD, shot on the same reservation as THE SEVENTH FIRE, premiered at the Berlin International Film Festival. Jack received a Discovery Award from the Hollywood Film Festival for his directing work. A graduate of Harvard’s VES Film Production Program and Werner Herzog’s Rogue Film School, his films have been screened at festivals around the world and at venues including Documenta Madrid, the Museum of Modern Art, the Museum of the American Indian, the American University in Rome, and at The White House as part of a special event addressing the most pressing criminal justice issues facing Indian Country residents today. 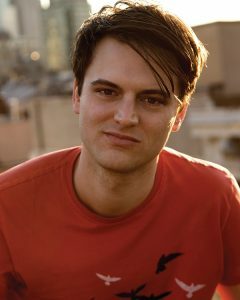 In 2008, Jack launched the production company All Rites Reserved, dedicated to producing films with global reach that push visual and conceptual boundaries. In 2014, Jack joined the directing roster of The Amoveo Company. (The Seventh Fire press kit). John Roach Center auditorium (JRC 126), which is located on the corner of Summit and Cleveland Avenues. Thank you to our sponsors: Augsburg College, American Indian Studies Department, American Culture and Difference Program at the University of St. Thomas, Augsburg Indigenous Student Association, Augsburg’s Marginalized Voices in Film and Media, and the Institute for Global Studies at the University of Minnesota.